Of course there is no such thing as ”National Unagi (eel) Day” on our calendar here in Japan, but I would think that the day almost deserves such a name. The day is actually called doyo no ushi no hi -– “day of the ox in midsummer” according to an online dictionary -- and said to be the hottest day of the year. 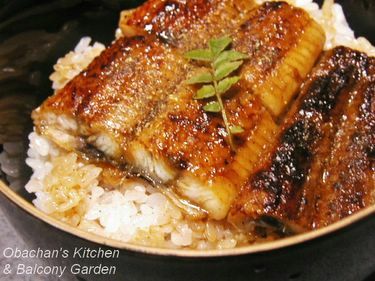 It is our custom to eat unagi on that day, and the “day of the ox” fell on July 28th this year. So what does the hottest day of the year have to do with unagi　? 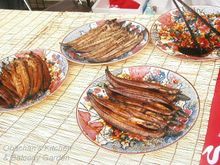 Well, here's a story widely known in Japan about how people started eating eel on that particular day. More than 200 years ago, owner of a very UNpopular unagi restaurant asked a guy for an idea for boosting their sales. The guy, Hiraga Gennai was a pharmacist and also a multi-talented genius who later invented something like an electrostatic generator. Gennai put up a poster at the restaurant, which said something like “Eat nutritious eel to beat summer weariness,” and people were convinced that it must be a good thing to eat such a nutritious food on the hottest day of the year. It worked like a magic. The ad not only saved the slumping restaurant but created a custom that has been passed down for more than 200 years. What a great sales promotion strategy, don't you think? I wonder if anyone today can come up with a promo phrase that has such a long-lasting effect. Anyway, today, we of course do not believe that eating eel on one particular day only can beat summer weariness. But we just have to try anything if it was said to be “good for health,” and here in Japan everyone does the same thing at the same time. Yes, I’m exaggerating, but maybe it’s not too far from the truth. 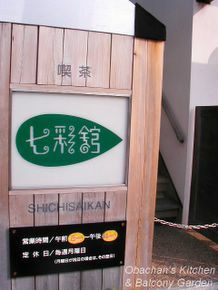 There was a long line right outside this well-known unagi restaurant in Kochi city. These people were there for unagi bento to go, and only a few bentos were left when I took this photo. Right outside a big supermarket, two guys were selling broiled eels. It’s not included in this photo, but there was a small BBQ grill next to this table and they were broiling the eels over charcoal. The young guy there was rather unhappy because I took a shot of the products they were selling only, not him. I didn’t have a nerve to just take a photo and say good bye, so I bought one there. The sauce came in a small plastic bag with the eel. In an ancient Chinese cosmology, Gogyo Theory (the Five Elements Theory), this world was considered to be made up of the five elements: fire, water, earth, metal and wood. When the theory was applied to the seasons, they associated wood with spring, fire with summer, gold with autumn and water with winter. They saw the earth (土, pronounced "do")as something to aid the other elements, and placed it between the seasons. The philosophy there is that all seasons and elements return to earth before transforming into the next one. So, the last 18 days of each season is called “Doyo (土用),” i.e., the period of earth. In ancient Chinese calendar, each day was associated with one of the 12 animals in the Zodiac. The "day of the ox” in the Doyo period between summer and autumn is supposed to be the hottest day of the year, perhaps because the sun comes to a certain point on the ecliptic on that day …. That’s what I think I understood from several websites I went through regarding the "day of the ox.” Corrections by experts would be appreciated. PLEASE! I hate coming back to my room which I won’t hesitate to call “the most unpleasant sauna on the face of the earth.” The stress I feel the moment I open the door must be affecting my mental health in a very negative way. To cope with it, I guess I need to feed myself with something refreshing and nutritious. Yes, the salad was very light-tasting and refreshing. 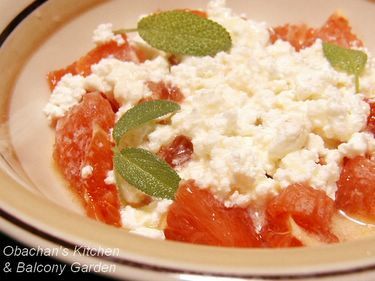 I liked the way the dressing complemented the taste of cottage cheese. I finished one bowl real quick and wanted more. Oh well, why not? This is one of those GUILT-FREE dishes, isn't it? Today I finally used my rhubarb for baking. A couple of days ago, its leaves started turning yellowish, showing a sign of some kind of disease, so I decided to use it before it died. 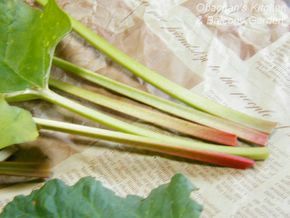 Now, everyone, this was my very first time using rhubarb in any kind of baking/cooking… I have tasted only a little bit of rhubarb jam before and that was it. I was so excited to find out how rhubarb chunks would taste when baked in a cake. 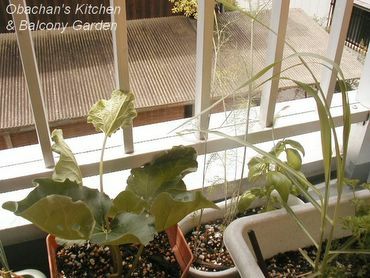 These rhubarb stalks were very thin and short, but I guess that was the best I could expect from growing rhubarb in a small pot on a balcony. I didn’t think they were enough for making any decent-sized cake, so after considering a few alternatives, I finally decided to downsize this recipe and make small cupcakes. I just don’t understand why, but the top of the cupcakes cracked in a strange way… Underneath the thin layer of granulated sugar and chopped cashew nuts, there are big cavities… But the taste is GOOOOOOOOD!! 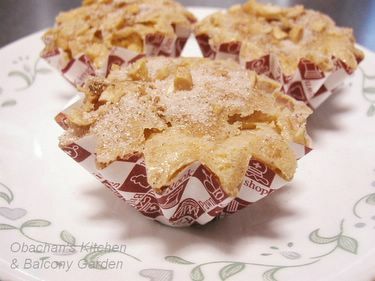 The sourness of the rhubarb chunks is just so refreshing in the sweet cupcake. Hmmmm.... I love it !! Horse Mackerel A La Provancale??? Honestly speaking, I don’t know exactly what the word “a la Provancale” means. 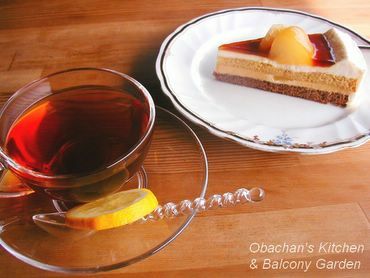 Now I often see, in Japanese cookbooks/websites, dishes named with Japanese translation of “a la Provancale” at the end. From their recipes, I assumed that "a la Provancale" meant a dish with garlic, olive oil and tomatoes. Is this wrong? Anyway, what I tried out this time was named “horse mackerel a la Provancale” in Japanese. 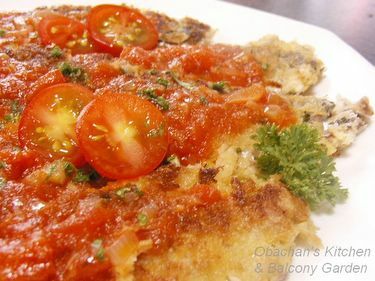 The horse mackerel fillets were salt-and-peppered and breaded (I mixed in chopped basil leaves in the bread crumbs), then fried in a frying pan. I made the tomato sauce with canned tomatoes. What I really wanted to do was baking the breaded mackerel fillets in the oven with the tomato sauce and grated cheese on top, but unfortunately I had no cheese left. I don't know if this is an appropriate combination, but I thought that it would have been really nice with garlic bread and vichyssoise. This is the cold udon I had at the Washi Paper Craft Village. 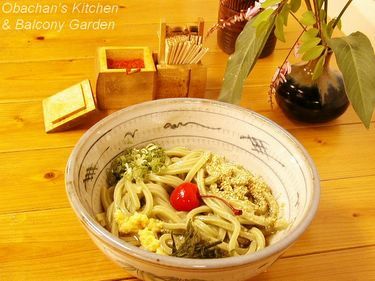 Green laver was kneaded in the dough, which gave the noodles refreshing green color. I guess they named it Kawa (river) udon because the laver came from the river. 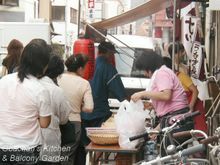 This udon was available at a small eatery in the building on the right, where they sold local vegetables and souvenirs. I dropped by a coffee shop after visiting the Paper Museum in a town called Ino-cho. What's on top of the cake was not a chestnut but pear compote. The brown-colored gelatin layer was caramel-flavored. The people there were super-nice. The lady who works there drew me a nice map when I asked the way to the closest tram stop. I was too tired and forgot about time, so it was already 20 minutes past their closing time when I checked out, but they never said anything about that... They just nicely gave me a coupon book, and kept regretting not having enough time to give me a lot more information about sightseeing in Kochi. When it’s so hot and humid, I love to have this for lunch. 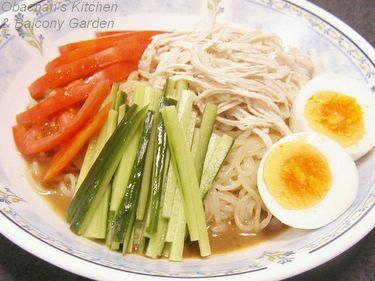 We call it 冷やし中華Hiyashi Chuka (Cold Chinese noodles) or 冷麺Reimen (Cold noodles). I’m not sure if this is a Japanese invention or something that came from China. Anyone? 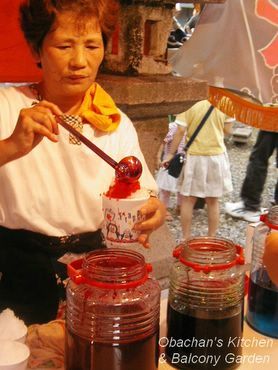 Unlike regular hot noodles, reimen is usually served in a very flat bowl or on a plate, and the soup is poured over the noodles just like dressing. Or you dip the noodles into the soup served in a separate small bowl and slurp. This was another ready-made stuff again. All I did was boiling/cooling the noodles and preparing the toppings. The sesame sauce came in a plastic bag and was pretty tasty. This is what I had today at Hirome: shio-tataki donburi (seared bonito seasoned with salt only and served on a bowl of rice). It was 600 yen with the small tea and miso soup. To be honest, I have heard that in some fishing towns in Kochi, people eat seared bonito with salt only without any soy sauce or ponzu, but never tried it myself. 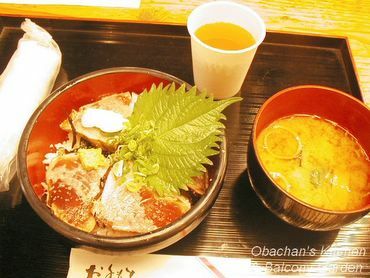 It is supposed to be the oldest preparation method of seared bonito dish and not very popular even in this prefecture. I’m originally from a small fishing town in the eastern Kochi, but I have never seen anyone eating seared bonito that way in my hometown. Usually, when making seared bonito, you sprinkle only a little salt (or no salt at all) over bonito fillet beforehand, and after searing it, you may or may not cool it in ice water. After slicing the seared fillet, you put bunch of minced scallions and sliced garlic all over the bonito slices and eat with ponzu or soy-based sauce. But for the shio-tataki, you use no ponzu, no soy sauce. You sear and slice a bonito fillet (never cool it in ice water), sprinkle good amount of salt all over and pat with hands. That's what I read about the traditional preparation method of shio-tataki. Maybe they used rock salt for seasoning? The shio-tataki was a totally new taste to me. Yes, as I had read in a book, it certainly brought out the taste of seared bonito better than eating it with ponzu or soy sauce, because tangy sauce and lots of garlic slices can cancel out the taste of bonito itself to some extent. If you want to fully appreciate the freshness of good bonito and the art of skilled searing, maybe shio-tataki is the best way. In other words, it’s no good unless the quality of bonito itself is very good. The shio-tataki I had today was not bad for the price, I thought, but for me, about three slices were enough. I grew up eating tataki with very tangy, yuzu-flavored ponzu-like sauce, so for me to really love shio-tataki over the ones I’m used to, it has to be the top-class one. 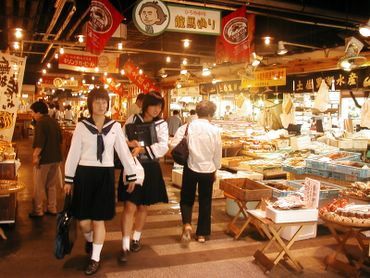 Hirome ichiba (market) is one of my most favorite places in Kochi. This spot is often introduced as a “food court” on the net, but in my opinion, it is much more than that. It is where you can encounter things new to you, and people new to you, and at the same time feel somewhat at home. I stumbled into this place for the first time when I returned to Kochi in 2000 after living in Kansai for about 20 years. According to its official website, Hirome ichiba was founded in 1998 as a new sightseeing spot. In addition to making it a place to introduce local cultures to both visitors and local people, they wanted it to be a place for people to socialize in a friendly, down-to-earth kind of atmosphere. 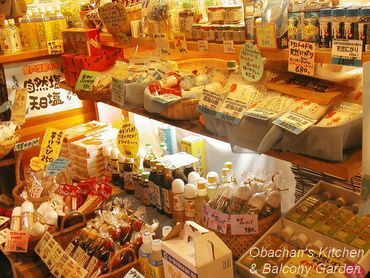 So among the more than 60 shops in this market, you see shops like a greengrocer, fish shop, meat shop, souvenir shop, craft shop and even a small computer school as well as izakayas and various eateries. 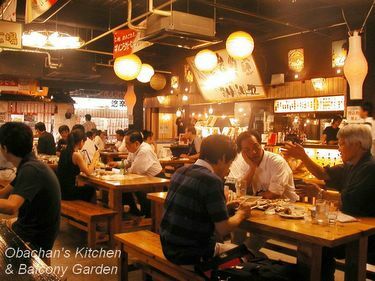 In the food court section, there are big wooden tables and benches surrounded by eating/drinking establishments offering variety of foods ranging from typical Kochi cuisine to spicy Southeast Asian dishes. It is a convenient place for locals to drop in alone and have lunch or supper (with some drinks if it's after work) for a reasonable price. For tourists, it is also a convenient place that is close to the 2 popular sightseeing spots, Kochi castle and the Sunday Market, and offers most of the local specialty dishes for a reasonable price. 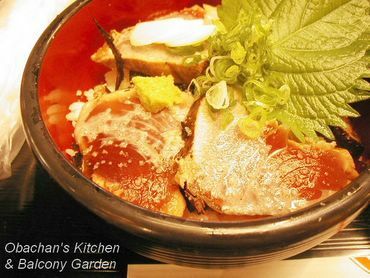 You can taste typical local dishes at Hirome, including 鰹のタタキ（Katsuo no tataki or seared bonito, the ultimate local food that Kochi is famous for）. One shop that recently opened in the market even shows the searing process to the customers. 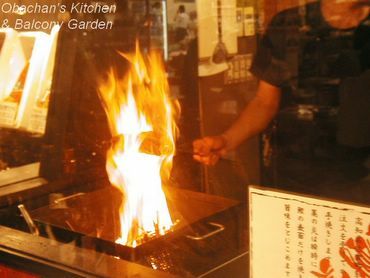 It is said that burning rice straw produces the best temperature for searing bonito, and at this place you can see the cook throwing some straw into fire to make a big flame to sear your bonito. 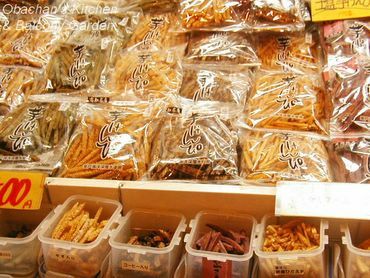 For more adventurous tourists, they have delicacies like ウツボの唐揚げ(Utsubo-no Karaage: deep-fried moray eel), どろめ (Dorome: raw baby sardines, usually served with dressing made from miso and garlic-leaf paste) and 酒盗(Shuto: salted bonito guts). I have never tried any of those. 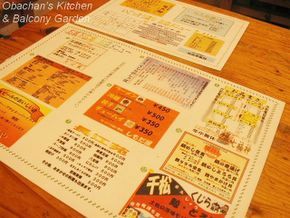 A menu and the map of the market are placed on each of the big wooden tables there. 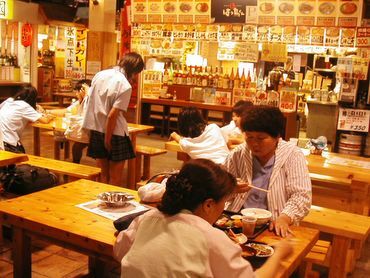 You can choose from the menu and go to any of the eateries (they have menu and often food photos/ samples there) and order what you want, then if they're not too busy, they may ask you where your table is and “deliver” the food to you when it’s ready. One shop even lists their phone number on the menu so that you can call them with a cell phone from your table and order food. Unfortunately they don’t have any English menu in Hirome yet. When you finished eating/drinking, you can just leave empty dishes and glasses on the table. Those on dish crew would come around with a cart and pick them up. The place turns into a more friendly place with somewhat "borderless(?)" atmosphere at night as many drinking places in the market open. People drink and chat cheerfully with their friends, and sometimes even with those who they met for the first time there. That’s the magic of the place, I think… I don’t know if it’s the size and alignment of those wooden tables and benches that make people feel easier to mingle?? Anyway, except for the very crowded times, I feel comfortable just dropping by and taking a seat there all by myself to have a drink. A couple of times, a cheerfully intoxicated person came to talk to me, and I didn't feel disgusted or scared… I just enjoyed chatting. There’s something in the atmosphere there that makes me feel it’s OK for such things to happen. Or maybe I feel so attached to Hirome ichiba because I’ve been to the big dance parties held there several times a year. Every year they have events like Halloween party, St. Valentine’s Day party, etc. starting at around 11:30pm after closing the shops in the market, and all the partygoers, both non-Japanese and Japanese, get together to drink, dance and have a ball. OK, I wouldn’t call this a total mess, but I couldn't help saying “OMG!” when this came out from the custard cup and landed on the plate. I didn’t expect it to turn out this flat. Wondering what this is? 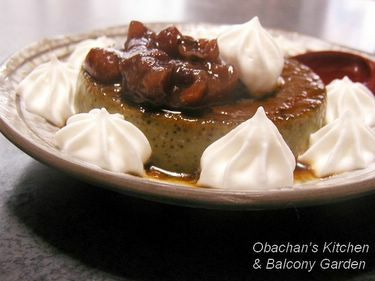 It is, actually, matcha custard pudding made from soy milk, egg, sugar and matcha (ground green tea). Would have tasted much better if it wasn’t overdone and laughably short like this. Bento means packed lunch or packed meal in Japanese. Those you see in the photo above are the 298-yen (apx. US$2.66 ?) bentos at a supermarket not too far from my apartment. Yep, all these are 298 yen each. I wouldn’t say they are very tasty, but with this low price, how can you complain? 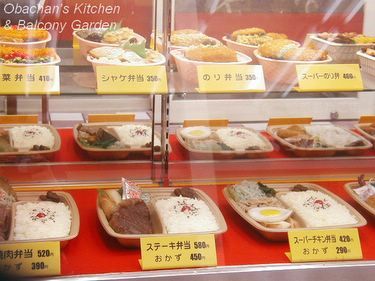 Talking about bento, there are roughly 2 types of bento places around here --- where they sell pre-packed cold bentos (though they can warm them up there with microwave) and where they pack warm bento after you order one at the counter there. The supermarkets and convenience stores fall into the former category. 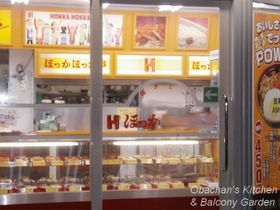 The latter, franchised bento shops, used to be my favorite but not so much any more. This is one of the bento shops near my apartment that sell warm bentos. There, you take a look at the samples in the showcase and order the one(s) you like, then take a seat in the shop and wait. The part-timers there of course do not cook everything from scratch after you made an order… most of the food is prepared or pre-seasoned already and all that’s left to do is to deep fry or grill or heat it. So the waiting time can be around 5 minutes or less… well, depending on what and how many of the bentos you order. You noticed some samples have 2 prices in the tag? The top one is the price of the bento with warm rice, and the one at the bottom is the price without rice. If you already have some cooked rice at home, you can buy a bento without rice and make it even cheaper. Good idea, isn’t it? 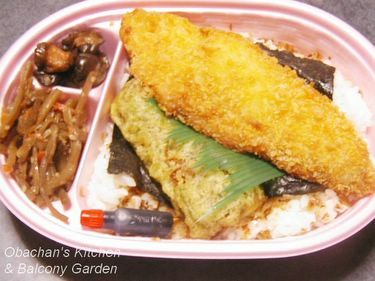 This nori bento (called “Nori-ben” for short) literally means “bento with dried seaweed (nori).” When this type of franchise shops became popular in Japan, this nori-ben was the most popular menu because it was the cheapest one and yet quite filling, though lacking in vitamins. “I’m going to have nori-ben.” or “I live on nori-ben” was synonymous with “I’m broke now,” ...well... at least among my friends. In earlier days, in a typical nori-ben, you didn’t see anything more than soy-sauce seasoned bonito flakes all over the rice covered with a big sheet of dried seaweed. Oh, maybe a few slices of pickles were on the rice. This one in the photo is a little upgraded version, thus could be a little smaller than the earlier versions, I suppose. 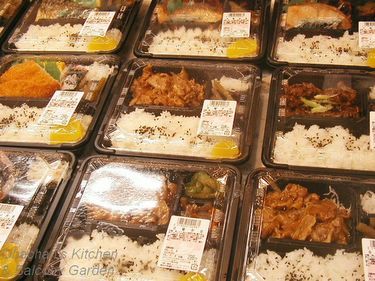 Of course, other than the bentos in plastic containers like these, we have more elaborate, expensive kind of bentos in Japan if you don’t mind paying good amount of money. 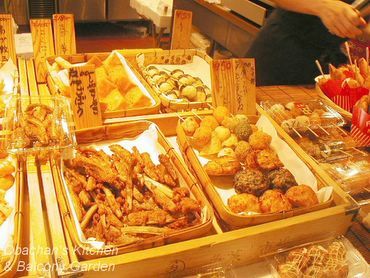 Those are the ones from famous traditional Japanese restaurants. I cannot afford to blog about them right now, but maybe someday I would give it a try. 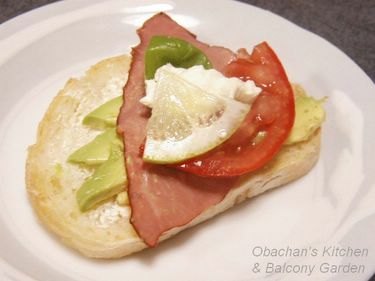 Light lunch today: An open sandwich with avocado, pastrami, tomato, basil, cream cheese and lemon on a slice of baguette. Tasted good, but did not fully satisfy my appetite, unfortunately. 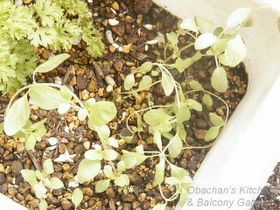 My herbs are definitely doing much better this year! 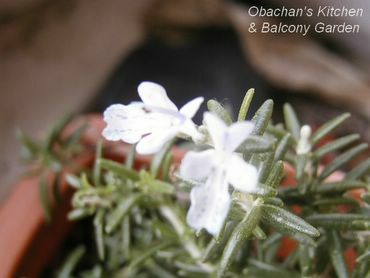 I was so happy when I found these little white flowers. Aren’t they lovely? 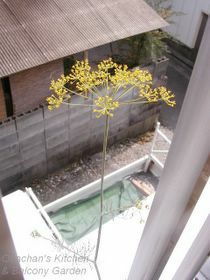 The way this lemongrass grew was really amazing. It was like this in May and stayed that way until very recently. Seems like it really loved the rain we had for the past 4 or 5 days. 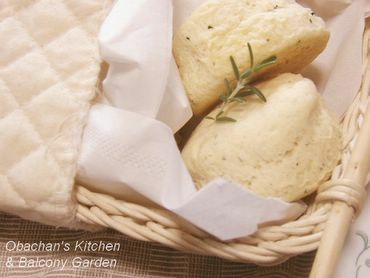 The five cookbooks meme I posted the other day inspired me to try one of the recipes in the “Kantan Scones (Easy Scones)”which I didn't even open for months. 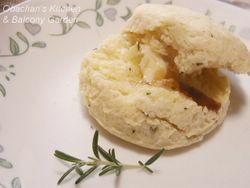 What I wanted to make for brunch today was herb scones. Though the recipe called for mint, I used rosemary. I went to a nearby shrine for a religious festival called “Wanuke-sama.” It is held on the last day of June every year in and around Kochi city (I guess??). For more information about this festival, click here. 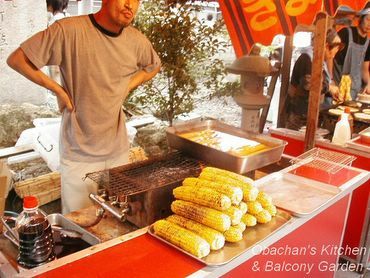 For me, (and maybe for many of you, too) one of the biggest attractions of any festival is the food stalls. Of course, I took some photos to share! You can smell this even from a distance! 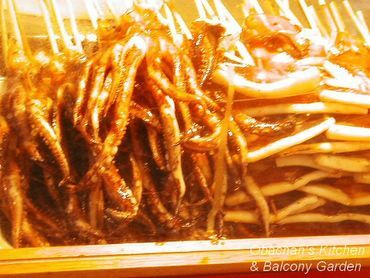 The squid on the skewers were dipped in sweet and salty teriyaki-style sauce and grilled. Hmmmmm…!!!! I almost never buy one these days, but I enjoy watching the cartoon characters on the wrapping bags. 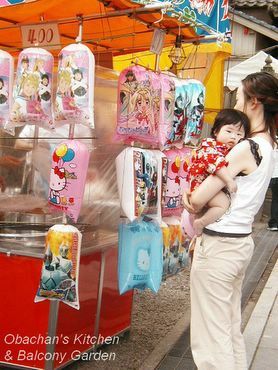 It was so hot and humid, so there was a long waiting line in front of this stall. 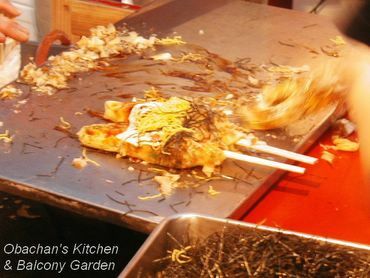 For those who know what okonomiyaki is, this is thin okonomiyaki wrapped around chopsticks. Toppings are sauce, mayonnaise, thin strips of nori (dried seaweed) and kinshi tamago (thin-sliced egg sheet). Yum! Well, hope I can live the rest of this year staying healthy and full of energy!